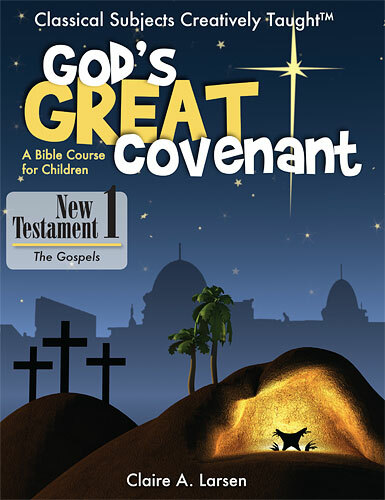 God's Great Covenant, New Testament 1 teaches the Gospels using stories, worksheets, memory verses, devotional guides and quizzes. Intended for students in grade 4 and up, this introductory text also teaches the historical, cultural, and geographical setting of the New Testament. There are 36 weekly lessons, divided into 4 themed units. Each lesson contains a memory page, a worksheet, a quiz, and a question to help further the thinking and conversation about the unit. Unit reviews are also included to help students revisit material already learned. The course is not your typical "extra" that many religion courses tend to be. This course is comprehensive and intense. Although my younger children enjoyed listening to the text, there is no way I could expect them to complete the work from this course. I would say that fourth grade was the absolute youngest that you can expect to get full benefit from this course. James is doing fifth grade work, but I feel that even waiting until he is sixth grade or older would maximize the learning for him. What I liked about the text is that it is history, religion, and even a little philosophy all in one. The story-like context held James' attention and created interest to keep learning. Unlike many complete courses, it has everything you need in one text, or two if you get the Teacher's Manual. No need to buy additional study guides and quiz booklets. There are additional materials you can purchase, but the course can be completed successfully if you are trying to save money, like me, and just want to purchase the book. I liked how it was from a kid's point of view and he was living during the time it was happening. God's Great Covenant, New Testament 1 can be purchased from the Classical Academic Press Website for $26.95. A Teacher's Edition is also available for $29.95. The Teacher's Edition is a full ﻿copy of the student text, as well as answer keys, teacher notes, and additional information to expand the learning. Due to the fact that James and I were doing the course together, I didn't find the Teacher's Manual to be as important as I do when I have the boys do work independently. As he gets older and I have him doing this work more on his own, I know the Teacher's Manual will save me a lot of time and stress. Classical Academic Press is a great resource to supplement your child's education. They offer the popular Latin For Children series, which I reviewed for TOS last year. In addition to Latin and Bible, they also offer materials for poetry, Spanish, Greek, French, and Logic. 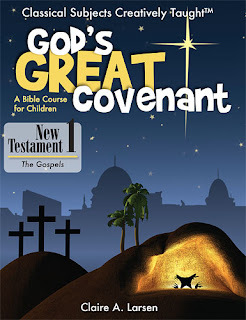 Disclaimer: As a member of the TOS Homeschool Review Group, a I received﻿ a free copy of the student text and teacher edition of God's Great Covenant, New Testament 1. I received no other compensation.